We can help you reach that goal without surgery! Accu-SPINA™ Center of Denver is a state of the art medical practice dedicated to the non-surgical treatment of lower back pain and neck pain. 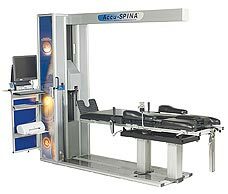 We utilize the Accu-SPINA™ system in conjunction with Osteopathic manipulation and integrative medicine techniques to provide relief and strengthening for a variety of spine disorders. The FDA cleared Accu-SPINA™ system is based on technology initially developed by physicians and scientists to treat back and neck problems unresponsive to other therapies. The Accu-SPINA™ system is successful in the treatment of degenerative disk disease, herniated discs and bulging discs in the low back and neck, as well as, sciatica and spinal stenosis caused by a herniated or bulging disc. Symptom relief of 86% has been demonstrated in clinical trials using this method of treatment. At the Accu-SPINA™ Center of Denver, your treatment experience will be individualized and comprehensive. Your care will be provided by fully trained, licensed and experienced medical staff, including a board certified Osteopathic Physician and a Physician's Assistant. IDD Therapy® was developed by a team of back specialists including neurosurgeons, orthopedists, physiatrists, osteopaths, neurologists, and physical therapists. It is a safe, painless and comfortable treatment. IDD Therapy® with the Accu-SPINA™ has been tested on thousands of patients in the last six years and found to be 86% successful in relieving lower back pain and neck pain symptoms. IDD Therapy® works by isolating a single disc level and gently separating the vertebrae surrounding an injured disc 5 to 7 millimeters creating negative pressure (or a vacuum) inside the disc. This negative pressure pulls water, oxygen, and nutrients into the vertebral disc area, thereby re-hydrating the degenerated disc. The IDD Therapy® treatment can reduce pressure on the vertebral joints, promote retraction of herniated discs, and encourage self healing and rehabilitation of damaged discs, thereby relieving the associated neck or low back pain. Twenty to thirty sessions are required to achieve optimal results. However, because the Accu-SPINA™ procedure is non-invasive, most IDD Therapy® patients can carry-on with normal daily activities. It helps reduce the pressure on the affected disc. It enhances disc health by creating a vacuum within the disc allowing the oxygen flow essential for disc health. This is accomplished through the use of a cyclical decompression and relaxation producing a spinal pumping effect. It relaxes and re-educates muscles that are in spasm through a unique secondary oscillation delivered to the surrounding muscle tissue at the peak of decompression. All this is performed while you rest comfortably in a soothing glow of light, listening to relaxing music. A heated massage bed feature assures that you will complete your treatment session feeling refreshed.